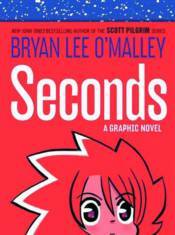 The highly anticipated new standalone full-color graphic novel from Bryan Lee O'Malley, author and artist of the hugely bestselling Scott Pilgrim graphic novel series. Seconds is a complex and novelistic standalone story about a young restaurant owner named Katie who, after being visited by a magical apparition, is given a second chance at love and to undo her wrongs. Fans new and old will love Bryan's bold and quirky style infused with his subtle, playful humor.